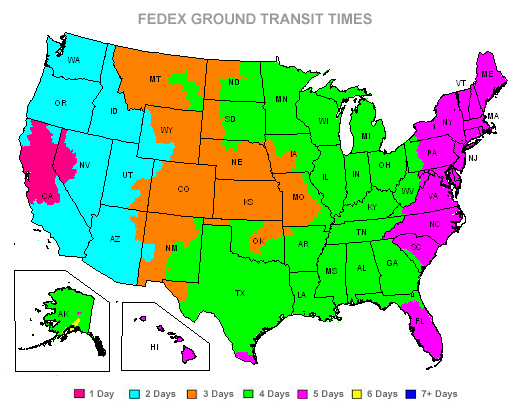 Federal Express: Orders placed before 3pm Pacific Standard Time Monday-Friday will usually ship the same day, orders received after the 3pm cutoff will ship the next business day. United States Postal Service: Orders placed before 11am Pacific Standard Time Monday-Friday will usually ship the same day, orders received after the 11am cutoff will ship the next business day. Orders requiring Saturday Delivery must be called in and specified, overnight orders that are not specified and paid for Saturday Delivery will be delivered by FedEx the following business day. Ecolocity LED is not responsible for any lost or stolen packages. If your shipment is damaged during transit, contact us immediately to make a claim with the shipper. Online orders can only be shipped within the USA and Canada. Please call 775-636-6060 for all other International orders. International Shipments are subject to duties, brokerage and VAT Tax fees. International customers are responsible for any fees or duties. Ecolocity LED is not responsible for these added fees. Orders shipped to Hawaii and Alaska may be subject to additional fees depending on size and method, please contact us if you need a specific quote for shipments to Alaska or Hawaii.